It’s been called the Golden Age of aviation, the pre-World War Two period when American vacationers arrived in Bermuda aboard opulently appointed flying boats providing comfort and style which rivalled that of any of the luxury ocean liners of the day. 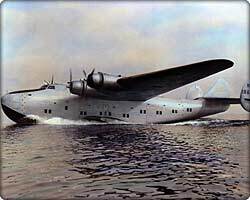 Pan American’s majestic fleet of flying boats—the “Clippers,” named after the far-ranging sailing ships of the 19th century—began arriving at the Darrell’s Island air station a few years after company founder Juan Trippe first visited Bermuda in the late 1920s. Britain’s Imperial Airways flying boat Cavalier and Pan American’s S-42B Bermuda Clipper inaugurated regular service between Bermuda and Port Washington, New York, simultaneously on June 18, 1937. Later that year, both airlines changed the terminal for their Bermuda flights from New York to Baltimore because of better weather conditions. Delaware resident Gil Kaufman—a longtime, Bermuda visitor and noted, amateur, aviation historian—gave a presentation in 2012 titled “The Bermuda Clipper, Forgotten Era of the Flying Boats” in Lewes celebrating these aircraft. His presentation described the flying boats in some detail, covering why they came to be and why they disappeared. The Bermuda Clippers—actually three types of aircraft, Martin M130s, Sikorsky S42s and Boeing 314s—ceased service after World War Two. They had been made obsolete by a combination of advances in aviation technology and the construction of airfields for military aircraft, including the one in Bermuda. Mr. Kaufman has had more than 50 years of experience in the aluminum industry, including executive management positions with Alcoa, Atlantic Richfield and the Aluminum Association. For many of those years he focused on aircraft and aerospace applications of aluminum. “When I was a lad of seven or eight years of age growing up on the west side of Baltimore City, my father would take me to the Baltimore harbor near a local airport known then as Logan Field to watch the Clippers take off for Bermuda and other (to me then) exotic places. These graceful and beautiful aircraft, and known as ‘flying boats’, were the first to fly the Atlantic Ocean to Bermuda, and later on the Azores and then to Spain, Portugal, or England. Such craft had been flying to the Caribbean Islands and South America for several years, and in the Pacific, island hopping all the way to China. But the Atlantic was notorious for its treacherous water and ill winds and so it was the last to be tamed by the Clippers. Why the Clippers, the flying boats that could take off and land in the seas? Many of the places visited in those days, including Bermuda, had no land-based airfield, and no easy place to build one. So to carry passengers to and from the islands required planes capable of landing and taking off in rivers, bays, or even sometimes in the oceans themselves. And these were first class flights, especially those aboard the bigger Boeing B314 Yankee Clipper, better known as a ‘flying hotel.’ Passengers were treated to first class amenities, including deluxe dining. Two aspects of his later life turned this early experience in the Baltimore harbor into a life-long interest in the Clippers, Mr. Kaufman has remarked. “First was my 40-year career in research on aluminum alloys for aircraft applications, including those designed to resist salt-water corrosion, an obvious necessity for the Clippers which were made entirely of light-weight but strong aluminum. The second was the pleasure my wife Ruth and I got from our many trips to Bermuda, where we could enjoy the destination of the Bermuda Clipper flights. I have amassed a mountain of information on the Clippers, one of my many hobbies.